Party Package – this package is most suitable for any events requiring dancing. It can be set up in a footprint as small as 2 x 2 m, or spread out for more dynamic impact to build the party mood. The look and feel of the set up, range of lighting and effects brings a superior ‘club look’ to your party dance floor. Reception Package – this package is most suitable for shorter events that only require background music, or with dancing but lighting is not necessary. It is designed to be subtler and blend in with the look of the venue and event, and requires a similar or slightly smaller footprint, without compromising on sound quality or look. 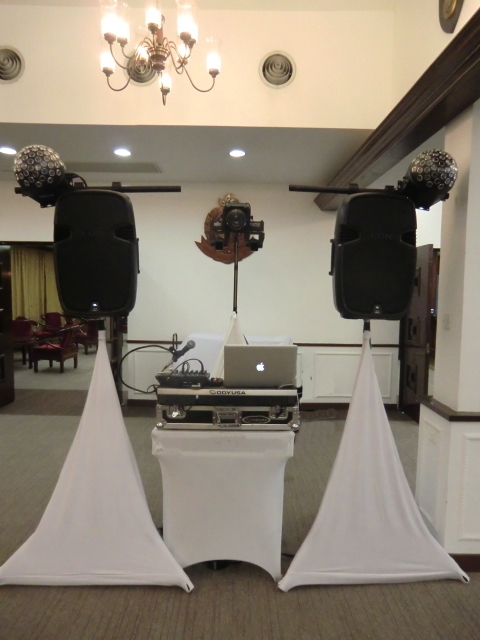 DJ Package – this package is intended for those functions where the venue or client supplies an audio system that the DJ can connect to. The only thing required is the express permission for the DJ to connect to the system. Be wary though that many function room and restaurant ‘in-house audio systems’ are only designed for speech or light background music, and are not suitable for a real party dancing atmosphere. Effects Package – this includes packages for various needs, and is intended for functions where the client has another entertainer and audio equipment provider but would like to add some mood, back lighting or dance lighting and/or effects. It includes set up, operator, standard lighting and/or effects . Both the Party and Reception packages are entirely self-contained and, other than a suitable space and dedicated stable power source, nothing is required from the venue or client. Audio quality for these is ensured by equipment from AKG™, Apple™, DB Technologies, JBL™, Native Instruments™, Shure™ and Yamaha™. Additional audio, lighting and entertainment can also be arranged for all packages. All packages include client and venue coordination. Click on either of the images to go to the Visual Set-up page. These FAQs about equipment, often overlooked by clients but crucial to the success of their event, might answer any other questions you may have. The event arrangements FAQs may also help as might this check list of the services. Looking for some entertainment for a wedding on a Wedding themed junk, it will be a very western celebration with mainly younger guests. We will have the boat from 4 – 11.